But I don’t know how to swim, and tubing definitely requires one to possess the most basic swimming skills. 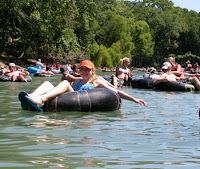 Thus, there’s my motivation: I’m thinking 4th of July weekend, new bathing suit, drinks, friends, all on the Guadalupe River! Sigh. I love getting super worked up about things. It’s how I never get anything done.